So every morning when I wake up, the first thing I see when I pop my little head out from under the covers (and mumble about how I hate mornings) is this big gorgeous tree that grows right in front of the window our bed faces. And every morning my thoughts go something like this, "Grunt. Too bright. Sleep. Orange juice. Man, what a great tree." BUT, right next to Great Tree is Dead Tree. I thought for awhile that it was just a late bloomer, but alas by April I realized it probably wasn't going to be joining Great Tree in its category of greatness. And each day as I walked by the Dead Tree, I realized more and more just how dead it really was. The bark was falling off, it was starting to split at the top...it was dead. 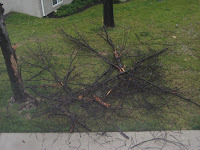 So now I start to worry, "If Dead Tree decides it needs to keel over, it's coming straight through our window or onto the balcony which is not fun." T and I even talked about it, "If that tree falls, it's coming straight for us." So, cut to yesterday. It was a nice day outside but around 3 o'clock these huge black clouds started to roll in and I got kind of happy. I'd run my errands for the day, gone to the gym. I had nothing to do, but stay inside and enjoy a great summer thunderstorm. So I was standing in front of the kitchen sink and I look up and Holy Crap, out of nowhere, those black clouds had turned into a full on, monster, I'm-going-to eat-you-hurricane. Crazy rain flying sideways, crazy wind. It was like Hurricane Dean, Jamaica style. I was half expecting the Wicked Witch of the West to ride by my window with Toto peeking out of her basket (I know, that's a tornado reference. But it was REALLY windy). So I immediately run to the balcony to see how Dead Tree is holding up and sure enough, Splat. All over the sidewalk at the foot of our building. Luckily, it wasn't structurally sound enough to keel over and crash through a window, it just splintered into a thousand pieces and fell. So goodbye Dead Tree. 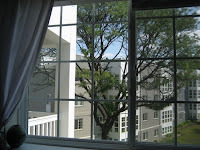 Now I can enjoy Great Tree in all of its splendor and not have to worry about broken walls or windows. That's a lot about a tree, huh? But it was a big deal yesterday. The Day the Dead Tree Fell.